Morning, I'm having a super Monday after a great weekend. You see I've had a very special person staying with me over the past few days, those who follow my IG might know exactly who I mean ... my princess, my one and only, my grand-daughter! This might explain why I'm a tad late with the publishing of this blog - but better late than never - as they say! I've had a fantastic time, had plenty of cuddles, lots of kisses and an abundance of love! She keeps me young, playing imaginary games of shopping, tea parties, bouncing on the bed and playing with my hair rollers - what's that all about? but never mind she's happy and that's all that matters. I'd forgotten that things a nearly 3 year old like are quite often on repeat, from the Sausage Stew she's eaten every night for the past three four nights, to asking what everyone's favourite colour is (mine's pink in case you don't know). My Jacques Vert Pink Lace Dress is one example. With the weather being very typical to the UK atm, not knowing if it wants to be hot or cold! Over the weekend we had stunning weather reaching, oh let's just say very warm, enough to wear a skirt (yes the legs came out - sorry who-ever caught sight of them) and no sleeves - yes I know can't believe some warmer weather has finally arrived. Not sure how long the warmer climate will stay - but who cares! Popped into Peacocks today, literally flew in grabbed these two tops and sprinted to collect my princess. Still haven't had time to see if they fit/look good, so dubious as to whether they'll be keepers or not! I'll have the answers by Thursday will it be yay or nay? - and I'd love you to check back with me then to see what the outcome is! Wanting bright cerise pink when I sprinted out today, but only found this little love in watermelon pink with white flowers all over it. I can't wait to style this - will probably go for my grey skirt again, but I'm looking forward to playing around with all the matches it will make. Pink Printer Split Sleeve Cold Shoulder. 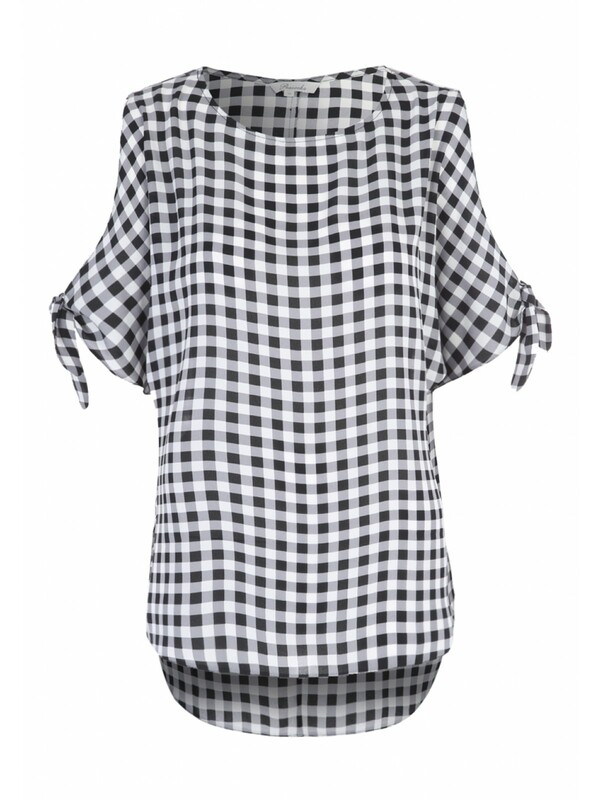 I've been wanting a black gingham top for a while now, but most I've seen have been OTS, which I'm not sure suit me, but I saw this today and knew I'd have to give it a try. Really liking the tie detail on the arms and I can see this being worn with loads of separates - including my Grey Skirt, along with my White Jeans. Looking forward to seeing what else I can pair it with - stay tuned folks! In the news today an Exhibition in Birmingham by Jodi Ann Bickley, with the theme being "A letter to my younger self; a letter full of hope to a stranger or a letter of guidance to a younger, lost you." I've already done this AGES ago, if you'd like to read mine here that'll be super, and maybe a small piece of advice to younger bloggers! Catch up again on Thursday, but I'd love to hear what you've been buying in anticipation of warmer seasons arriving, I'm wondering what you lovely bloggers will be wearing in the coming months! Just to add, please pop over to see Jess at Elegantlydressedandstylish where she's featuring a beautiful Hand Painted Scarf. Labels: Gingham, Peacocks, Watermelon Top. I just bought some red wedge espadrilles---I'm always a sucker for new shoes in the spring!! So lovely to have the GKs, eh. Was reunited with mine yesterday now I'm back home, such fun. Saw BW gingham in Primark but it was a bit girlish, this Peacock looks spot on, can just see you in this. our Peacocks is integrated with supermarket, am doing my weekly shop there today (food, not weekly clothes!) Am on a skirt hunt but a gingham top may turn my eye :-). Buy has been utility jacket. The gingham top is fabulous. Thank you for your comment in my blog ! Pinks and gingham are some of my all-time favorites! 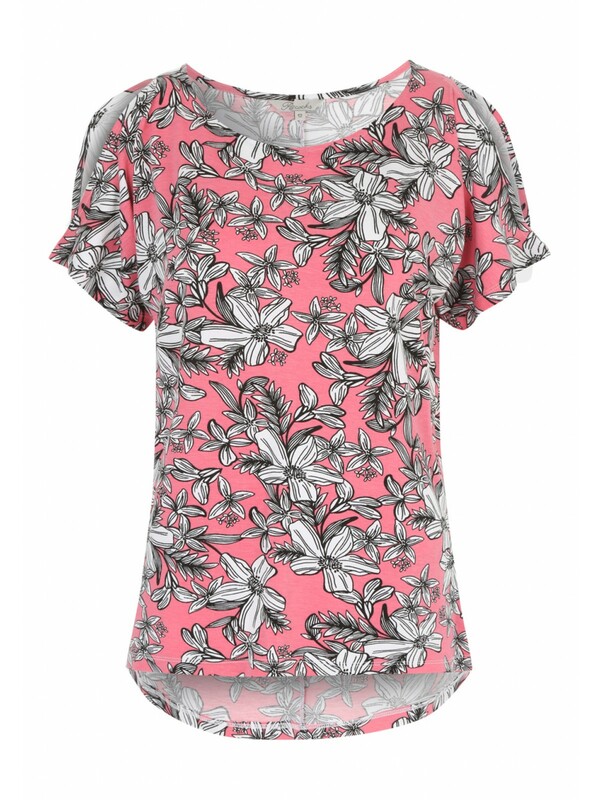 I love that floral pink top! It looks so feminine for spring! Love the pink top! I have a bit of pink for my Spring wardrobe. Its a fav. The gingham will go with so much, love it! I have been buying dressy and casual sandals. Cant wait to wear em! love the black and white top! I love the gingham top! It'll go with so many things. I'm very late to the gingham party - I need to get a cute top like that one!